With a day or so left to go in 2017, I wanted to do a G.A.S. (Gear Acquisition Syndrome) update for this year. All told, I bought seven cameras, which is actually a little less than in the past couple of years. This includes the Canon G7X Mark II, that I just got for Christmas, which was, by far, my most expensive purchase. All others are what I classify as “toy” cameras and were actually very inexpensive. During my Japan trip in the summer, I bought two cameras. A non-functioning Olympus 35 EC 2, in great condition. I bought it for about $10 as a display piece for my cube at work. It’s a beautifully classic film camera but inexpensive enough that I wouldn’t be overly concerned if it were ever to walk away. The second was a quirky Superheadz Sun and Cloud, a camera that has an electricity generating hand crank, a solar panel and a traditional USB plug to power the camera. It’s billed as the first “self-sustainable” camera. The picture quality is terrible, but it’s a unique camera and a fun collector’s item. I think it originally ran about $100, which is more than I would pay. I found it on Amazon Japan for about $20. Earlier in the year, I went to my first swap meet at Precision Camera and picked up a Olympus C-5050. A high-end 5MP enthusiast’s camera from 2002. I’ve been quietly collecting “classic” digital cameras, because it’s fun to see how much digital has evolved in such a short time. Also, these early digitals are dirt cheap. Originally introduced at $799 (equivalent to $1082 in 2017 prices), I paid $15, if memory serves. I bought a paper camera, called a Paper Shoot from Taiwan via eBay. The shell of the camera is made of thick paper (more like coated cardboard), which wraps a simple electronics motherboard with lens, processor, AAA batteries and a SD card slot. I opted for a plain white case but the company also sent me a couple of extra designs. At $50, it’s a bit expensive relative to image quality but it affords a unique shooting experience, which I’ll talk about in a future post. During Black Friday, B&H Photo had a $89 special on a Fujifilm Instax Mini 90, Fuji’s top of the line Instax Mini camera. I’ve toyed with the idea of getting an Instax Mini and the price was too good to pass up. Normally, they run $130 – $150. I’ve already used it on a couple of Drink and Click portrait shoots for a playful and low-tech alternative to “serious” digital portraits. I’ll need to showcase some of these in a future post. Fuji Instax is an instant film that, while low-res, has a unique film look. Done right, and with some luck, you can get some wonderfully dreamy images. Just before my recent trip to New Orleans, a visit to Precision Camera yielded a camera I’ve been looking for. They had a beautifully kept, nearly pristine Olympus Trip 35 for $65. The Trip 35 was a very popular point and shoot camera from the late 60s through the early eighties. Other than the zone focusing, everything else is automatic. 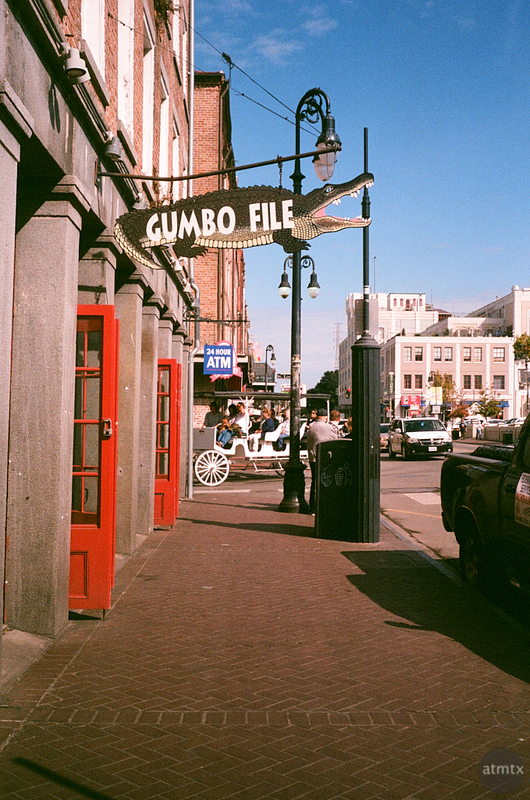 I shot a cheap roll of Fujicolor Superia 400 in New Orleans to make sure it worked properly. The photo above is the best exposed out of the 24 shots. I’m glad that the camera worked, though it underexposed more than I liked. For the next roll, I’m going to overexpose by a stop, loading 400 speed film but setting the ASA to 200. That, hopefully, will yield better quality “thicker” exposures. Finally, my most expensive and decidedly not a toy, Canon G7X Mark II, rounds out my seventh. With a one inch sensor, it’s my pants pocketable, take anywhere camera. At $650 it’s quite expensive, but companies, unfortunately, charge a premium for portability. Hopefully it’s worth the price. I’ve been satisfied, for the most part. I’m getting a good idea of its limitations and where it excels. So there you have it. My crazy list of cameras for this year. Many of my 50+ cameras in my collection are quite inexpensive. They’re either old film or digitals bought inexpensively and novelty or specialty cameras that are noteworthy for different reasons. Someday, I’ll need to make a complete list of them on this blog. The one thing I know from following your work across a plethora of cameras is that the camera is the least important factor. You seem to get your look consistently no matter what camera is in your hands. Thank you, Michael. I guess this is a good thing. I don’t know if this is driven by a hardened sense of style or that I’m, at least, technical proficient at making consistent exposures regardless of the camera. I think it’s a great thing – something I aspire to reach someday. You’re more consistent with a look to your photography across your large collection of cameras than I am with my two (well, three if you count the iPhone). Now, what I want to see are shot shots from that Olympus C-5050. Maybe a short series of posts as a blast from the past. My daughter has an Instax Mini 90. She has a good eye for photography — better than mine for sure. I’m hoping to showcase the C-5050 along with my other classics, but my plans seem more ambitious than what I’ve been doing. I think I still owe you, and others, my throughs on Capture One. The Instax Mini 90 can be a fun camera. Very different from digital, of course.